Though technically seeds, Brazil nuts are famous for their taste and textures. They are encased in a hard shell, which makes them appear much like nuts. It is these shell like casings due to which most people mistake them for nuts. Usually found in the rainforests of the lush Amazon basin, the Brazil nuts have made their way into the international markets simply for their many health benefits and their rich, creamy taste. Brazil nuts are highly nutritious. A serving of 100g of Brazil nuts add about 656 calories to your diet. However, since they are rich in fiber, this small serving is also high satiating. A serving of these seeds contain 7.87 mg of vitamin E, 1917 µg of Selenium and traces of thiamin, riboflavin, folates, pantothenic acid, niacin and vitamin B6. In addition, these seeds are also a good source of minerals such as calcium, manganese, magnesium and copper. In short, they are not only filling and delicious, but contain a lot of vitamins and minerals as well. 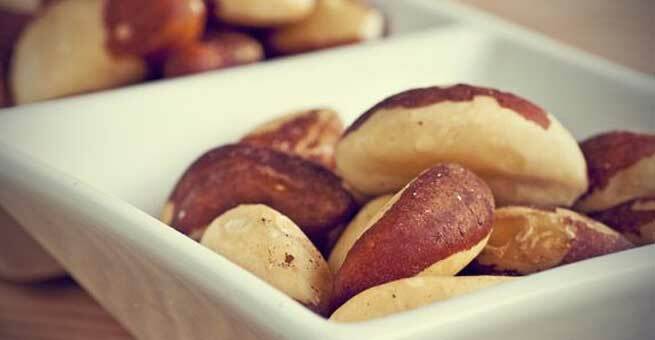 A 100g serving of Brazil nuts takes care of 51% of your RDA of thiamin. Cholesterol Busting: Brazil nuts are full of healthy essential fatty acids and unsaturated fats. These are great for your heart as they help combat LDL, also known as bad cholesterol. Brazil nuts contain both monounsaturated fats and polyunsaturated fats, which are beneficial for your heart and your circulatory system. However, do remember that 100g of Brazil nuts contain about 65g of fats. Therefore, it is best to consume the nuts sparingly. Improving Autoimmune Health: This is a vital dietary mineral, required only in trace quantities. Selenium is crucial for maintaining the health of the autoimmune system. It also helps the thyroid gland of the body function normally. Though selenium deficiency is rather rare, those who do not have consumed any other dietary source of this mineral could resort to Brazil nuts to get more than seven times their RDA. Improvement of Muscle Functioning: Brazil nuts have a very dense nutritional profile. They contain magnesium, a mineral which is vital for improving the functioning of muscles. Magnesium prevents build up of lactic acid in the muscles and therefore prevents soreness and muscular pain. Magnesium is also catalytic in the breaking down of proteins into much simpler amino acids. Therefore, they are important for the digestion of proteins and their absorption into the body. Improvement of Skin and Hair: This fat soluble vitamin is essential for many of the physiological processes. However, its most vital function is the manufacture of collagen, an elastic tissue of the skin that gives you a youthful appearance. Vitamin E is also highly beneficial for lightening scars and improving the quality and texture of your hair. Enhance Skeletal System: In addition to all the other nutrients, Brazil nuts also contain some amount of copper which is important for the skeletal system. Copper is one of the raw materials for the formation of the bone tissue. Therefore, it is important for maintaining bone health. Copper also helps in the formation of the softer, connective tissue. There are many other uses of copper as well. It is vital for absorbing iron into the blood stream and production of color pigment melanin which helps protect the body from the harmful ultraviolet rays of the sun. Though at the outset, Brazil nuts seem to be a great food – nutritionally dense and packed with vitamins and minerals. However, they are also high in fats and may not be that beneficial to you if consumed in large quantities. Ideally, you should consume Brazil nuts only sparingly, consuming about 100g at a time. It can have several adverse neurological effects. Though toxicity due to these seeds is very rare, consuming large quantities of them could cause nervousness and may even lead to paralysis. Some of the other side effects could include sudden weight increase, brittle nails, hair loss, irritability, skin lesions, dental decay, depression, granulomas in the lungs and chronic inflammation.